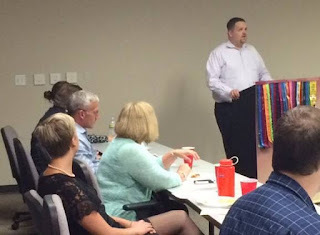 On June 17, 2015 the First Command Toastmaster’s group hosted an Open House where the benefits of Toastmasters were discussed with visitors from both within the company as well as outside the company. The Open House had a variety of individuals from various employment backgrounds ranging from tax, IT, and financial advisors. The theme for the meeting was summer, which was very fitting given that the summer solstice was only four days away. The club provided hot dogs, chips, a vegetable plate and cherry and apple pies for desert. The weather was not as accommodating however – at least not for the North Texas region as it was raining and 75 degrees. A total of nine guests attended – six of which were invited by five of our present members. Three guests had found out about the meeting by word of mouth, or by the promotional advertisement placed within our daily company e-mail sent out to our office. The meeting was a typical meeting showcasing all that Toastmasters has to offer to potential members.